Right in the middle of the barren Nubra valley stands its oldest and largest monastery – the beautiful and milky white Diskit Monastery. Diskit Monastery is located at an altitude of 3142 meters; and that is not surprising because Ladakh is essentially the land of monasteries. After the scenic views, its these monasteries that people turn to when they’re here. You can approach Diskit via the Diskit village; a rugged and dusty road that will be exhausting and exciting at the same time. Nubra Valley was founded in the 14th-century by Changzem Tserab Zangpo, the disciple of Tsong Khapa. Currently, it belongs to the yellow hat sect of Buddhism, also known as the Gelugpa order. The monastery is beautiful to say the least. Within the Tibetian style Gompa, there are beautiful frescos and decorations that you can’t help but marvel at. An iconic feature of the prayer hall of the monastery is the statue of Cho Rinpoche (Crowned Buddha). What takes the cake though is the panoramic view of Nubra Valley that one can get to see from the top of the monastery. 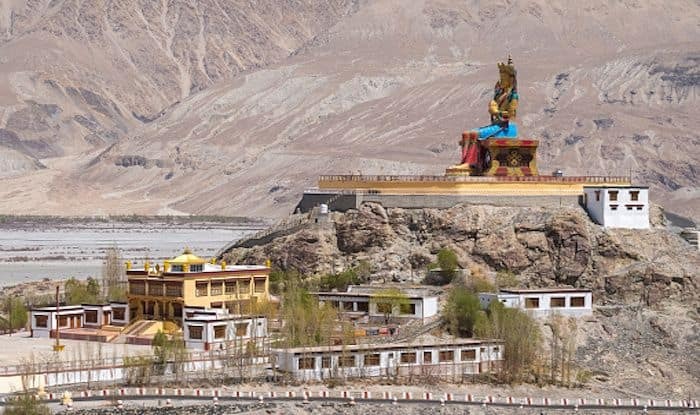 Right across from the monastery is the impressive 106 feet long statue of the Maitreya Buddha facing the Shyok river, which interestingly, flows into Pakistan. It is said that the statue took 6 years to be built, and was inaugurated in 2010 by His Holiness Dalai Lama. The reason it was built was to prevent any kind of war with Pakistan and to promote world peace. The easiest way of reaching Nubra is to take a shared bus or taxi from Leh. From Leh, most of the transports depart via the Khardung La pass; the highest motor-able road in the world. Once in Nubra, you could take a taxi to various attractions. The best time to visit here is between July to September as that is when the roads are clear. Dosmoche festival, held during the month of February, is also a great time to plan visit to the Diskit Monastery.